Irvine Meadow have been rewarded for their third-round Active Nation Scottish Cup elimination of Arbroath with an away tie at Hibernian. The Ayrshire junior side at the weekend became the first junior side to defeat a senior club in the Cup. Hearts have been drawn away to Aberdeen, Morton or Dumbarton host Celtic and Rangers travel to Hamilton. St Johnstone travel to Forfar, while Kilmarnock host Falkirk and Dundee United are away to Partick Thistle. Irvine Meadow general manager Ian McQueen said of the trip to Easter Road: "I would imagine that we'll take several thousand fans through. "Hibs have a great support as well, so it'll be virtually a full house I would imagine, which obviously brings its financial rewards as well and which we will be very grateful for. "It could mean keeping us going for a couple of seasons, literally, and it'll also mean that players' contracts, for example, can be secured. "It just makes all the difference to a club like Irvine Meadow." In the third-round replays to take place on Saturday, Brechin take on Wick Academy and Dumbarton face Morton after draws last weekend, while Stenhousemuir will play Cove Rangers after their match was abandoned due to heavy fog. Clyde will try to stage their match with Livingston on Monday 7 December after Saturday's game was abandoned because of the fog and the rearranged tie was called off on Tuesday due to a frozen pitch. 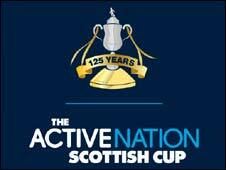 Cowdenbeath will travel to Alloa on Tuesday 8 December after their third-round tie ended goalless at Central Park. Ties to be played Saturday 9 January 2010, except Hamilton v Rangers, which has a 1215 GMT kick-off on Sunday 10 January.